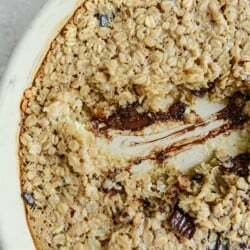 Dark Chocolate Chunk Cheesecake Baked Oatmeal. I’m a leeeeettle cheesecake obsessed. Can’t get enough of cheesecake–like things. Want all the cheesecake things. Especially trashed up cheesecake things. They are so me. This is sort of a cheesecake-like thing. I don’t mean to mislead you, but… we aren’t putting cheesecake in our oatmeal. Which doesn’t sound like such a terrible idea – soooo, we should probably get on that. Maybe Saturday morning after too many glasses of wine. But this is some baked oatmeal that just kinda tastes like it has cheesecake in it. I basically have decided that I can add mascarpone cheese to anything semi sweet and have it taste like cheesecake. Best discovery ever. And we all know I have the sweetest teeth in the universe. So I think I’m on to something. Weird thing: I also don’t even care for oatmeal, unless we are talking instant packets of peaches and cream or a darn good chewy cookie. BUT THIS. gahhhhhhh. I obviously was too busy shoveling it in my mouth to take a decent picture. So if I am going to eat oatmeal, it has to be good oatmeal. Flavorful, textured, trashed up. Me oatmeal. This is one way to do it. My next adventure is taking these flavors and making a quinoa breakfast bowl. Actually, I might do that for lunch. Wild and crazy. That’s me. Preheat oven to 375 degrees F. Spray a 9×9-inch baking dish with nonstick spray. In a large bowl, whisk together oats, sugar, baking powder, salt and cinnamon. In a small bowl, whisk together milk, egg, and vanilla extract. Add the wet ingredients to the dry, stirring until combined. Stir in the mascarpone cheese, breaking it apart with a spoon but allowing it to remaining in chunks. Stir in the chocolate. Pour in the baking dish and bake for 23-25 minutes, or until the the mixture is just set. The time may be a bit shorted or longer if you use a different sized baking dish. You don’t want to overbake it! Remove from the oven and serve immediately with extra milk for drizzling. Dark chocolate = antioxidants. Big bowl of health. Roasted Corn Caesar Salads with Parmesan Greek Yogurt Caesar Dressing. I’m thinking that I will be making this over the weekend. Oh my gosh YUM!!!!! I love pretty much anything cheesecake! OMG this looks amazing! I love cheesecake too! Is there anything better? Thank you for this little gem of a recipe… I can’t wait to try! This is one big bowl of comfort! Yum! 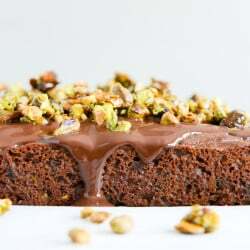 Would this work with cream cheese instead of mascarpone, and 1% milk? I’m just trying to find a way to make this without a trip to the store! Looks amazing. Sometimes I stir cocoa into my oatmeal as it is cooking. Love me some chocolate at breakfast. This looks great. Thanks! That looks and sounds absolutely delicious! Can’t wait to get back home from vacation to try it! Thanks for the inspiration…. I LOVE oatmeal and I CAN”T WAIT TO TRY THIS!!! This looks Incredible!!!! All of your recipes are AMAZING!!! Are you coming out with a cookbook soon because that NEEDS to happen!!!! can I have this every morning?? I love almost everything about this. Except for the coconut milk. What could I use instead? Would normal milk do the trick? I did not have coconut milk so I used 1% milk in the oatmeal and topped it with a drizzle of half-and-half – it was delicious! I don’t use this term lightly…but I finally made this and it is freaking amazeballs. I doubled the chocolate, naturally, but I don’t even think it needed it. Amaze-balls. Oh Boy. This looks decadent! I love the combo of oatmeal and chocolate chips. :) I will certainly try! Thank you for sharing! Is this something I could put together the night before so I can just pop it in the oven in the morning? Ohmygosh. SO good!!! I used cream cheese in lieu of mascarpone and regular milk instead of coconut. Drool.